Please welcome fellow member of the Guppy Chapter of Sisters in Crime Kelly Cochran to this week’s edition of 10 Q & As. Kelly describes herself as conscientious, resourceful, suspicious, witty and blondish. Her writing is humorous, approachable, twisty, thoughtful and fun. 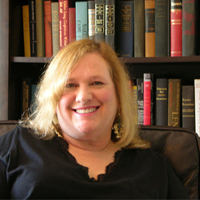 Kelly’s short story “Blinded by Murder” appeared in the most recent Guppy Anthology, Fish or Cut Bait. In addition to her other attributes, she is also generous. She is offering to provide one lucky commenter with a copy of Fish or Cut Bait and a second commenter with a copy of her novel, Buying Time. Without further ado, here are her other eight questions and answers. You have a table for four at your favorite restaurant and can invite any three people, living, dead, or fictional. Who are your guests (and why) and where are you eating (and why)? First, I want to thank you Jim for getting me a table at the 21 Club in Manhattan for my birthday. Yes, today is my birthday. Though the table inside the private dining room in the wine cellar seats more than four it is the perfect place for an intimate party. If the food and the wine cellar aren’t enough to draw you in to the former speakeasy, the history should be. The floors have been walked on and chairs sat on by the likes of Earnest Hemingway, Dorothy Parker, and Alfred Hitchcock among others. I’ve invited Brené Brown because of her inspirational views on vulnerability. Being a writer is a very vulnerable thing. Fiction writers create fiction, but in reality, the truth of who they are is there within their words for the world to see. My second guest is Paula Poundstone. As a standup comedian, another vulnerable occupation, she has the gift of making people laugh. She is naturally funny, which in my view is the best kind of funny. She has also battled her own demons in the public eye and survived. Lastly, I’ve invited my husband to my party because somebody has to pay! All kidding aside, he’s at my party because he is truly my best friend and who doesn’t want their best friend at their birthday party? Unfortunately, I haven’t yet found my most productive writing venue. This is evidenced by the fact that my second book, Borrowed Time, isn’t currently on anyone’s nightstand. But I can imagine it. The window looking out over the ocean, the chair custom made to fit my derriere, lots of wood furniture, plants, and a masseuse on standby. The serene environment is what I dream about. My mind is always cluttered, so I need an uncluttered surrounding to provide balance. Until such time as I win the lottery and create my perfect writing venue I am happy at my cubicle-like, utilitarian desk. I find I am most productive early in the morning or late at night. I definitely need caffeine in the morning, but only one or two cups (a Coke if I’m feeling thirsty). Late at night though, no caffeine for me otherwise I wouldn’t be able to sleep and I’d find my late night turning into my early morning! Lately I’ve ventured into reading books I might not normally pick up, books outside my wheelhouse. The first is P. A . De Voe. Her expertise in ancient China amazes me. She educates and entertains at the same time. Her short story “Lotus Shoes” explores young Mei-hua and the cultural expectations of foot binding. Next would be Kaye George and her Death in the Time of Ice. Her writing makes you care about her characters and their future. And my final recommendation is better known, but she’s my favorite author - Anne Tyler. She is a master of the slightly different, average character. It amazes me how she brings the reader into the mind of her characters and the lilt of her writing leaves me wanting more and sad that the story has come to an end. In the early 1980’s I signed up for a writing course with Writer’s Digest. I was lucky enough to have my life touched by author H. Paul Jeffers. In corresponding with him, I told him how afraid I was of not succeeding. His words to me were encouraging and I will never forget him telling me that if I do not write I am guaranteed not to succeed. Though it took me over a quarter of a century to publish my first book, it was his words I remembered when I first saw my words in print. Do I have to pick just one? I have many challenging areas. The most challenging I would say is time management. I’m an Indie author and I always say the best thing about being and Indie author is you can set your own deadlines and the worst thing about being and Indie author is you can set your own deadlines. I know if I had a publisher deadline hanging over my head I would go without sleep to meet it. But as an Indie, my television addiction seems to get in the way. Two things I am doing to address the issue is setting up a “writing time” and transitioning from a pantser to an outliner. Apparently nothing. I really have been procrastinating and there is no excuse especially because the most incredible feeling of accomplishment comes when I see my words in print. What motivates your protagonist? What influenced who they are today? My protagonist Aspen Moore, like me, also suffers a little when it comes to motivation. But, also like me, when the nth hour is upon her she rallies. And when she does it is generally those people around her that she cares about who keep her going. As a member of the Witness Security Program (WitSec), the struggle between Aspen’s past and her present greatly influences who she is becoming. She struggles with connecting to the people around her when she can’t be her true self and as a result her life is quite the circus. Check out Kelly’s books and find out more about her at www.kellycochran.com, visit her on Facebook and she’d be delighted if you followed her on twitter. In Buying Time, Aspen Moore starts a new life as a personal concierge, selling her time to those who don’t have enough. The best perk is getting to focus on other people’s lives instead of facing the demons in her own. When her most loyal customer dies and his suicide looks eerily like murder, she anonymously tips off the police so she won’t expose a secret she desperately needs to keep. But a string of crimes long enough to make a real detective sweat threatens her livelihood and ultimately her life. Her only hope is to untangle the mess before there’s permanent damage. Pursuing the truth means solving a decade-old land deal while juggling a quirky DJ and his dog, an eccentric paraplegic, a curious set of twins, and a flirtatious neighbor with spy gadgets. 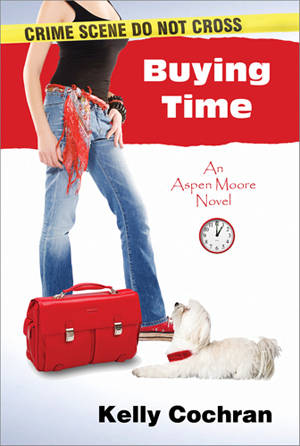 With each passing hour the danger increases and for Aspen, buying time isn’t an option. Ha ha ha. I like the blondish comment. Supports the witty description. Being a sometimes blonde I understand where Kelly is coming from. I love the sense of humour that comes out in your answers. I'm off to amazon to check out your books. LOL...let me try posting again as me and not SinC St. Louis. So as I was saying.. Thanks for commenting Kristina and for checking out my books! But you may want to wait to purchase if you were considering because you are so far the only person to comment which might make you a guaranteed winner! I'll be picking a winner next Tuesday! From one blondish to another thanks for embracing the humor in my answers! Wow, that's really nice of you. I'm going to share to facebook. People love to win books. It's interesting that you say that, Kristina. I've found people seem to have become somewhat jaded about winning books -- even those signed by authors. Anyone else seeing that, or just my myopic view? Well I'm in the camp of winning is wonderful. I've been to quite a few facebook launch parties lately and there seems to be a lot of enthusiasm about winning books. I've also found that when someone wins one of my books, they are more likely to post a review. It worked, Kristina. I saw your post on Facebook, and I'm here. I enjoyed your Q & A, Kelly. Time management is a huge challenge for me as well, especially by Thursdays, when I'm started to really feel tired from the day job & all the other writing/household responsibilities (and I only work part-time!). By the way, about 10 years ago I was a member of the Guppies and had a lot of encouragement from women, particularly two who became my critique group for a while. I self-published a couple of novels, and then I found a publisher and it was a whirlwind 4 years with them. And now I've found Imajin. It's another whirlwind, but I'm still learning a lot about promotion and all the demands that go with it. There's also a lot of great things about being an indie, and I plan to do more self-publishing as well. Best of luck! Thanks Kristina what an incredibly unselfish thing to do! I posted on my own Facebook and didn't seem to get any traction. I think some times people are so busy and there are so many things competing for their time. Debra...thanks for commenting and sharing your struggle with time management. I wasn't sure what Imajin was so I searched and discovered it was a boy band! LOL.... I knew that wasn't right so I kept looking and found it was a small publisher! Glad you have found them! What a fun post, Kelly. And, yes, Kristina, you'll love Buying Time--both for the humor and for the mystery that is full of twists and turns. It's just the puzzle to keep the mystery reader happy. Buying Time sounds great. I love a mystery with a bit of humour. Kelly, sometimes all you need for a bit of traction is exposure on a new site. I know I inundate my facebook page and I'm sure my friends are all used to seeing my posts about writing. I think we can all help each other by expanding everyone's network. Debra is on the same page with me and we share, share share.. I would love to have a book donated to your library, although I DO like free books! Good luck with your new book, Kelly. I've been waiting a long time for it! Kelly, it's great to see you here! I think Aspen is just as charming as you are, dear friend. Kelly, this blog ate my comment. GRRR. Sending you hugs! I think Aspen is almost as charming as you are. My post got eaten too. My copy of BUYING TIME arrived today. Thank you Kelly, I can't wait to read it. It's a wonderful book. I'm about 3/4 of the way through and can't put it down. Kelly's sense of humour definitely comes through.